Film-maker Danny Boyle has dismissed speculation that he could direct a James Bond film after the appearance of 007 in his Olympic opening ceremony. James Bond actor Daniel Craig filmed a segment with The Queen for the ceremony, which Boyle co-ordinated. But asked on BBC Radio 4's Front Row whether he could direct a full-length Bond movie, Boyle replied: "No, I'm not very good with huge amounts of money." 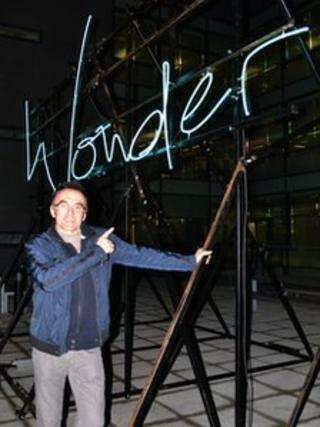 He was speaking in Salford as he turned on a neon artwork he had designed. Front Row asked him to choose a word to be lit in neon on top of the BBC's Salford's MediaCityUK complex. Boyle chose the word "wonder" after Isles of Wonder, the title of the opening ceremony. Media captionDanny Boyle talks to Front Row's Mark Lawson about why he will never direct a Bond film. "Certain people can handle that and I love watching those kinds of films, but I'm much better with a smaller amount of money and trying to make it go a long way." Speculation about a future Bond film surfaced after Boyle pulled off a coup by persuading The Queen to act with Daniel Craig in one of the highlights of the opening ceremony. Boyle's previous films include Trainspotting and Slumdog Millionaire and he is currently editing his next production, Trance, a thriller starring James McAvoy, which is due to be released next spring.